It is truly an age of unrest and social media. Events overseas such as the Tahrir Square uprising have thrown the power of social media into the spotlight, as the non-linear networks provided real-time information. 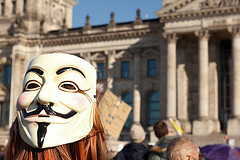 Multiple hotspots around the wold have recently seen social media become the organizational tool of choice for dissent. Caryn Wagner, undersecretary of the DHS, told an audience Monday at the National Symposium on Homeland Security and Defense in Colorado Springs that the agency began to draw up guidelines for monitoring social networking sites after the sites were heavily used during government uprisings in the Middle East and North Africa this year. The platforms most noted are Twitter and Facebook, which should surprise no one, as they were front and center in the news coverage of those events. Like I always tell my clients, if you don’t want it out there, don’t put it on the Internet in the first place. The data is public and easily accessible to anyone with an Internet connection. Now, if they start going after non-public data, that is a whole different ballgame, and not a nice one. The really disturbing part is that, while marketers have been mining this sort of info for quite some time now, the government is only just starting to noodle it out. Still, the timing is interesting. Certainly, there are enough examples around the world to make DHS take notice, but one cannot help but wonder how much the Occupy Wall Street (OWS) movement has to do with the decision. After all, it is fueled by the same decentralized social media tools. This week, the world witnessed another intercontinental event that has become the hallmark of protest in the Internet age. In four continents, from Tokyo to Toronto, thousands of people joined the Occupy Wall Street (OWS) protest movement, which began quietly last month in Manhattan’s Zuccotti Park. This was the first such globally coordinated protest since 2003, when between six and 10 million people in 60 countries took to the streets on a single weekend to protest against the impending US invasion of Iraq. The scale alone should make you sit up and take notice. It’s gotten big, and it continues to grow, fueled by a collective anger that is not unlike that of the French Revolution. The fact that the movement has attracted a wide array of people that cannot simply be discounted as “hippy activists,” speaks volumes. Just take a look at the suddenly swelling number of American veterans joining the OWS ranks. The injury of Scott Olsen at an OWS event, a peaceful protester who just happens to be a two-tour veteran of Iraq, has galvanized the ranks of our military, and they are turning out in greater and greater numbers. Another good example is Big Labor, which is hopping on the OWS bandwagon in Oakland,CA. Again, this is all fueled by the Internet, which is now being scrutinized much more closely by the Department of Homeland Security. As I said, interesting timing. Image by cadillacdeville2000, used under its Creative Commons license.